I recently received an email from a 16 year-old young woman in Asia, who was first diagnosed with scoliosis at the age of 11. Her parents have put her in multiple types of therapies, including various types of yoga and a CLEAR treatment program, which she traveled to a different country to attend. Unfortunately, she says that none of those therapies have proven to be beneficial for her spiral spine. The Cobb Angle measurement of her thoracic region is 40 degrees and her lumbar is 29 degrees. She also has significant rotation in her ribcage and her left rib pops forward and her right rib pops backwards. She asked me to review X-rays and pictures of her back and offer my advice. She’s granted me permission to share her specific story, so that others may learn from her situation. When you look at her X-ray, go ahead and mentally flip it over, as the “R” on the left side indicates that it’s actually the right side of her back. Meaning, her major curve goes to the right, not the left. Based on her X-ray and other materials, I drew a quick diagram sketch of her back, so I could get an accurate snapshot of her body. If you aren’t familiar with drawing a diagram sketch of your back, go to the Starting Point video series to learn how. You may notice that this young woman’s diagram sketch looks almost identical to my own sketch, featured in the Starting Point series, although her lumbar curve has a higher degree of curvature than mine does. This is the most common form of idiopathic scoliosis (upper curve to the right, lower curve to the left), so your own diagram sketch may look similar. By using this diagram sketch, she’s now able to properly assess where to place pads during yoga and Pilates (also outlined in the Starting Point series). Adding some sort of padding (support) when she works out will help her to decrease the lateral shifting of her spine, along with decreasing her rotation. In addition to using pads, I also recommended that she work on strengthening the muscle tone surrounding her spine to help support her scoliosis. A really helpful diagram that demonstrates which muscles need to be strengthened and which muscles need to be relaxed, can be found here. The muscles shown in red are the muscles that are too short and need to be released. By referencing her X-ray (or your own), the same muscles on the other side of the spine then need to be strengthened in order to bring the spine back to a better alignment. A Pilates instructor should be able to strengthen the muscles that are too long with exercise and a good manual therapist should be able to release the muscles that are too short by using their hands. If you look at her X-ray again, notice that the ribs in area 2 are closer together than those in area 1. Lengthening and then strengthening area 2 will be a huge component in helping her spiral spine find more of a neutral alignment. Stretch area 2, then in an elongated state, work to strengthen area 2. Finally, I recommended that this young woman measure her rotation with a scoliometer before and after each workout and manual therapy session, since her rotation is pretty intense. She needs to track her rotation to make sure it’s getting better with each session she does. An easy way to do that is to download the Scoliometer by Spiral Spine app for your iPhone. You can just whip out your mobile device before and after each session to check on your progress. Please note: Due to time constraints, I am largely unable to review individual cases. I’m sharing the case study above so that others with similar cases may be able to apply the findings above. Did you look for any other kind of practitioner besides just yoga? I’m not sure where you live, but Pilates instructors are all around the world. You might want to see if you can find one in your town. Swimming can be very good for people with scoliosis for strength reasons. Please make sure that you tilt your head in both directions when you take breaths and that you are evenly doing strokes on both your right and left side. Research actually shows that some serious swimmers have scoliosis (I don’t remember if the study was for function or idiopathic scoliosis off hand though). It was concluded that the scoliosis could possibly be from only breathing on one side, or at least it didn’t help the scoliosis if it was idiopathic scoliosis. Please make sure to breathe on both side. When done correctly, swimming can work your back muscles very well. I have a new scoliosis 40 minute exercise video coming out in the next few weeks (hopefully, this process has taken longer than expected…). 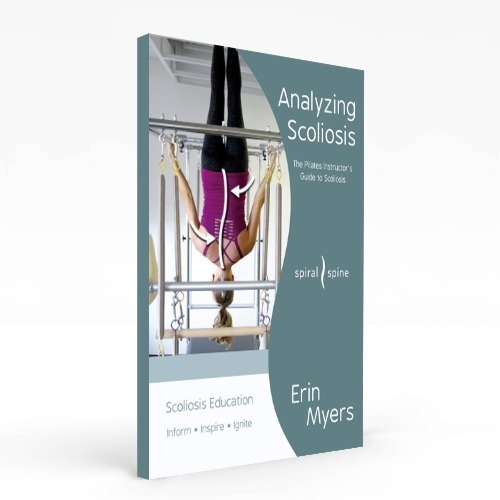 So, if you can’t find any practitioners who know how to work with scoliosis, you can do the video at home. I plan on coming out with many different kinds of exercise videos for scoliosis over the next few years to help people like you who can’t find practitioners in their town. Until then – swim! Just tilt your head to both sides when you swim. Hi Erin, I couldn’t find a yoga instructor who has experience on scoliosis patient. I wish to know does swimming really help? Because I know swimming does stretching both sides of muscle. But since my spine curve towards right, I know that I will need to stretch my left side and strengthen it. I have a new scoliosis 40 minute exercise video coming out in the next few weeks (hopefully, this process has taken longer than expected…). So, if you can’t find any practitioners who know how to work with scoliosis, you can do the video at home. I plan on coming out with many different kinds of exercise videos for scoliosis over the next few years to help people like you who can’t find practitioners in their town. Until then – swim! Just tilt your head to both sides when you swim. I would also measure your back before and after your swim with a scoliometer to see if this form of exercise is helping your back and not hurting by being if your rotation has decreased.